A police investigation is under way after jet-skiers were reported to have invaded north-east waters that are home to a legally protected seal colony. About a thousand large grey seals reside on the Newburgh coast and should be able to swim around the mouth of the River Ythan without harassment. That makes it an offence to intentionally or recklessly harass seals in that zone. Nonetheless, video footage of two men flouting that protection on the Ythan estuary was captured and shared online at around 7.30pm on Monday. 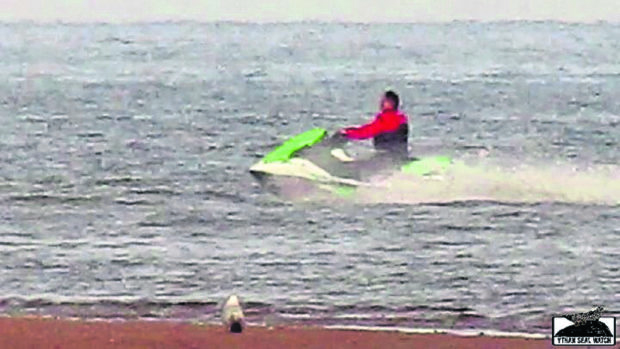 The pictures showed one man in a florescent yellow vest riding a red jet ski and a second on a green jet ski, wearing a red and black jacket. A hundred strong flock of eider ducks, most of whom are still sat on recently lain eggs, also took off from the beach after being disturbed by the noise. Scottish SPCA chief inspector John Carle said police were investigating the “unacceptable behaviour” and appealed for witnesses to come forward. He said: “We are aware of an incident involving jet skiers in protected waters. “Police are investigating and any information should be passed on to them as soon as possible. There are currently 195 areas which are covered by the Protection of Seals (Designation of Haul-Out Sites) (Scotland) Act 2014. Haul-out sites are identified land and sea locations that are thought to be important for grey seals resting and moulting during the summer months. A Scottish Government spokesman said: “The Ythan haul-out site was identified as being an important location for grey seals, which is why Scottish Ministers designated it as a seal haul-out site in 2017 to provide additional protection from intentional or reckless harassment. Police said they were aware of the allegations and enquiries were ongoing.